"How much?" I asked. And got the astonishing answer of just $3.99 per pot. So I wheeled my shopping cart over and picked out five. Another woman was there doing the same thing. Someone else took one. I really wanted more but didn't think I should really grab them all, mutinously saying "Mine!" like a two year old. No doubt Mary would order more. I'd ask if she'd telephone when they came in. Never would I have thought of buying hellebores at the supermarket. Look how pretty, look how healthy. 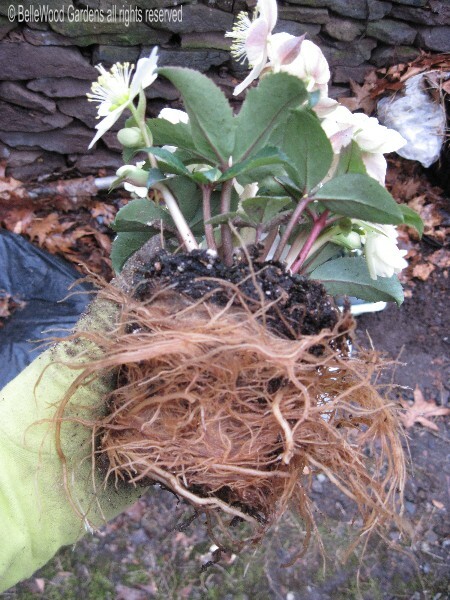 Helleborus ×ericsmithii is named for the noted English plantsman, Eric Smith. Fairly complex interspecies hybrids, they're a cross of the Christmas rose, H. niger and H. ×sternii, itself a fertile hybrid of H. argutifolius and H. lividus. The different clones have somewhat different amounts of pink, mauve, cream or green in the flowers, various degrees of silver, marbling and serration in the foliage. I already have 'Silvermoon', wouldn't care if these are the same. Not the same, it's 'Joker'. Note: a search of the literature offers an alternate name of 'Winter's Song' for this cultivar. Much nicer, and that's the name I'll use. 15 to 18 inches tall by 24 inches wide. Flowers, two or more per stem, open from January through March. It's too soon to plant these out in the garden. Not from any concern for overall hardiness, but given the fact that they've spent time indoors. I've been bringing them outdoors in the morning to a sheltered-from-the-wind location, then trundling them into my toolshed overnight. I'm figuring on a mid-March planting date. plastic. 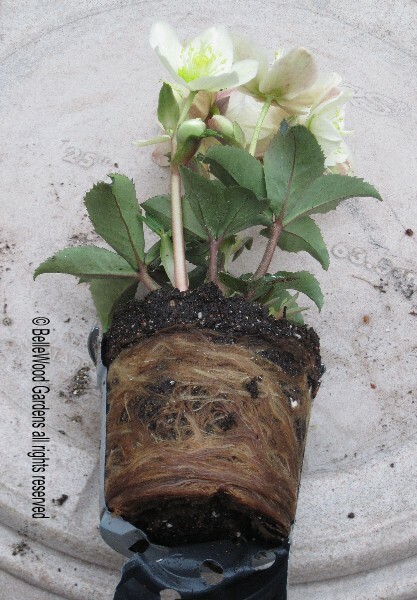 If merely plopped into a larger pot the roots would continue to circle. They need to be released. Usual advice is to make vertical cuts, top to bottom. I did that with one pot, then decided to tease the roots of the other four plants. I used a thin bamboo barbecue skewer, which worked marvellously well. Compare the size of the two pots. It looks like a tremendous jump up in size but actually it is not. The teased out roots nearly fill the new pot. That's fine for the three or so weeks they'll be in them. consisting of 3 parts well decayed compost, 3 parts potting soil, 2 parts fine vermiculite and 2 parts sand. I spoke to Mary, the floral department manager at the Shoprite supermarket. 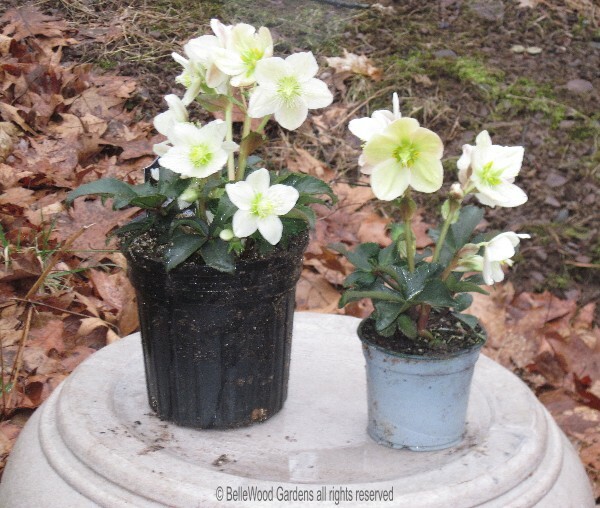 She's been ordering two more cases of hellebores but not receiving them. She called to let me know she'll be getting two cases tomorrow. But they won't be the 4-inch pot size for the bargain price of $3.99. Instead what's coming in will be 6-inch pot size. For $12.99. Sigh. I was ready to buy another 10 but not at that price. I might not buy even one. But I'll look . . . .
will grow and thrive, in company with the other hellebores already here. Winter will have a new song. I got a telephone call from my friend Jerry Barad, who wanted to let me know he'd seen this Diary entry. 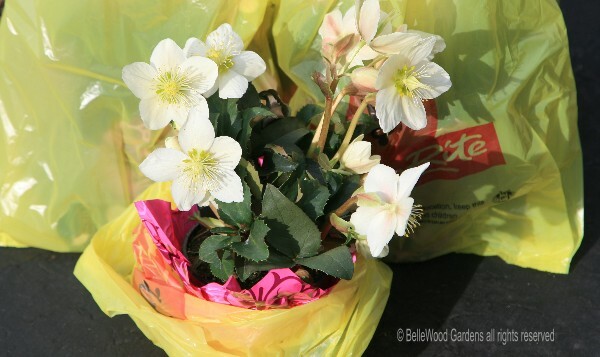 And apparently hopped right into his car, drove to Shoprite, and bought two pots of hellebores! Way to go. He asked for my suggestion of where to keep them until planting out time and we agreed on his cold frames. 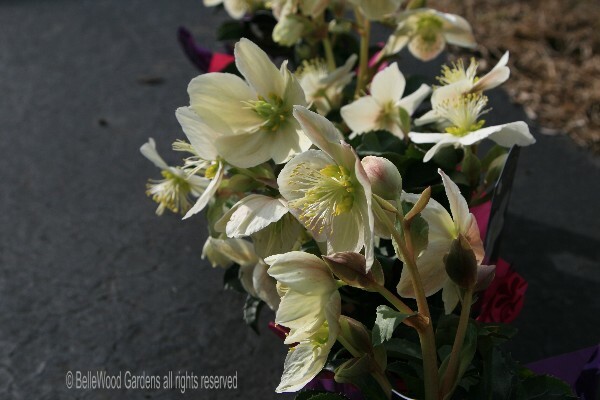 I'm glad to hear that someone else finds these hellebores as attractive as do I. It doesn't pay to be a snob. 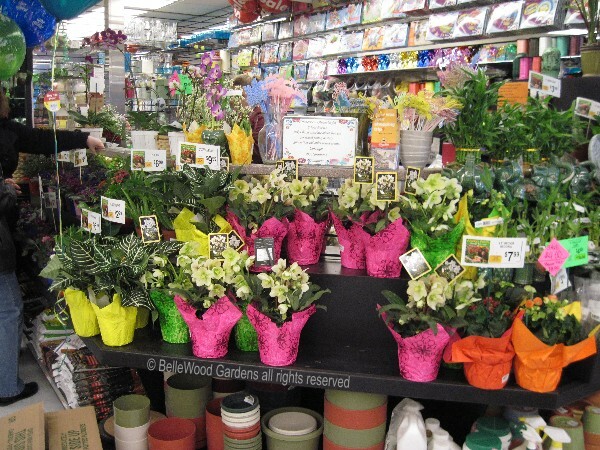 Good plants are where you find them, supermarket or upmarket nursery.